The two successive seasons of deficient rainfalls has worsened supply of horticulture crops and fodder in the western Indian states including Maharashtra and Gujarat. The scenario has resulted into a sharp increase in the prices of vegetables with some varieties disappearing from spot markets. The scarcity of fodder, however, has prompted farmers for mass scale migration of milking animals in search of food and water. While vegetable supply has already deteriorated, the situation is likely to aggravate with rising temperature in coming weeks. It may also hit milk supply in coming months. “There is an acute shortage of water in many districts of Maharashtra. The nearby state of Gujarat is also facing drought. Hence, the supply of vegetables and fodder has been very low. Consequently, vegetables prices have skyrocketed. Farmers have started migrating for safe place in the districts like Aurangabad, Sangli, Vidarbha among others,” said a senior Maharashtra government official. According to the Indian Meteorological Department (IMD), cumulative rainfall during this year’s pre-monsoon season upto March 20, 2019 received 27 per cent below the long period average (LPA). The southwest monsoon rainfalls for 2018 for the entire country were reported at 91 per cent of the LPA with half of villages in Maharashtra reported drought. This was followed by 43 per cent deficiency in the northeast rainfalls this year for entire India. The deficiency of rainfalls has hit agriculture crops in both seasons i.e. kharif and rabi with actual output reported lower than their forecasts made in the beginning of the seasons. Private forecaster the National Bulk Handling Corporation (NBHC) has estimated India’s total cereal and pulses to decline by 10 per cent each and oilseeds production to fall by 4 per cent this rabi season due to drought in major cultivating regions. The Union Ministry of Agriculture has reported a total foodgrains output at 142.27 million tonnes for kharif 2018-19 as against the total output of 140.73 million tonnes for the previous year. “Vegetables prices have increased sharply due to lower supply. Unavailability of fodder due to drought in Maharashtra has also jacked up cost of milk production resulting into lower profit margins for farmers. To pass on the cost of production increase, therefore, farmers may raise their milk prices by upto Rs 2 a litre in coming months,” said Madan Sabnavis, Chief Economist, Care Ratings. 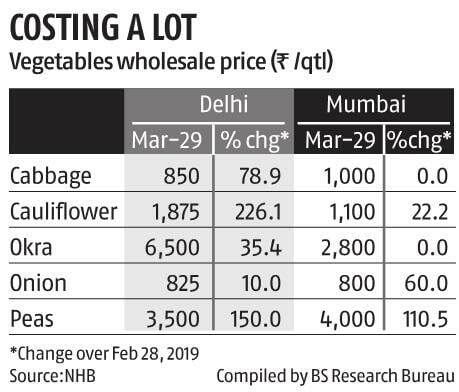 Data compiled by the government owned National Horticulture Board (NHB) showed cauliflower arrival in Mumbai Agricultural Produce Market Committee (APMC) declined by 10 per cent in March to 273 tonnes. Its prices, however, have jumped by over 22 per cent in the wholesale APMC Mumbai market to Rs 11 a kg. Similarly, arrival of brinjal round slumped from 24 tonnes to 14 tonnes in March alone. 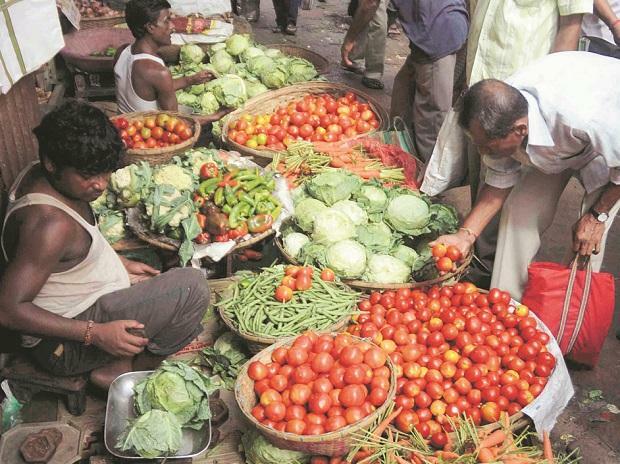 Sriram Gadhave, President of All India Vegetables Growers Association, believes that consumers will have to pay higher prices of their horticulture produce due to lower production this year. The Union Ministry of Agriculture in the beginning of the current season had forecast India’s horticulture production at 314.67 million tonnes for 2018-19 as compared to 311.7 million tonnes reported in the previous year. Gadhave said that a large portion of the horticulture production was damaged due to drought in Maharashtra and Gujarat.